An ashtray is more than just a place to tap your cigarette or toss loose change that collects in your pocket throughout the day. One look at the skeleton and skull ashtrays found here and you will see that ashtrays can also be fine little decorations, as well as vivid and impressive collectibles to own and enjoy! Virtually all of the ashtrays offered here in this section have their own unique flair, ranging from fantasy to history and beyond. But their common factor is their skeletal, bony nature. Many are made, at least partially, out of cold cast resin, and all have a detail-oriented design that makes each one an impressive little thing to behold. Each gothic ashtray here depicts skulls and skeletal features in one way or another. 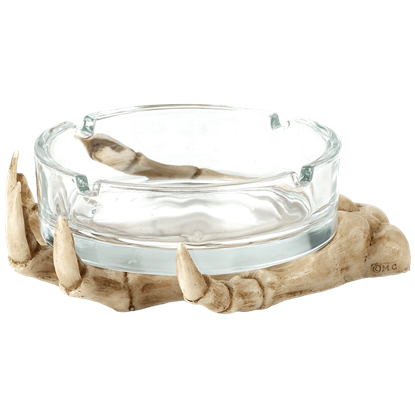 Some lend helping hands, by offering skeletal hands that hold out glass ashtrays and bowls for use, while others just feature touches of bony, skull-infused design throughout the classic form of the ashtray. By far, though, the most common style of skeleton ashtray found here is the skull, whose open jaws or opened cranium serves to catch your ashes or hold your pocket-clutter in unbeatably eerie style. 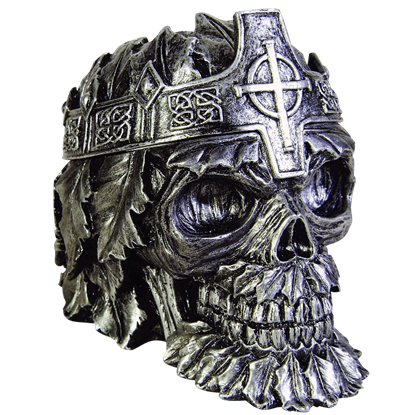 The skull ashtrays themselves come in a variety of forms, including classic bone-white skulls, spiked monster skulls, Roman soldier skulls, biker skulls, pirate skulls, jester skulls, and more! It goes without saying that any of our skeleton and skull ashtrays are great for gothic tables or for gothic rooms in general! 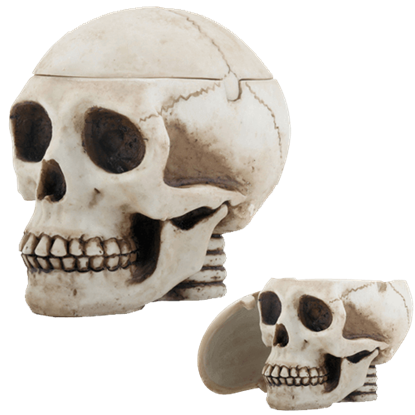 So if you are looking to bring some haunting and eerie form and function to your decor, you might want to consider one of our skeleton or skull ashtrays, as they are good for much more than just holding cigarettes and catching ashes. This Greenman King Skull Ashtray is a beautiful piece of art that is hand painted. The Greenman King Skull Ashtray is made of cold cast resin, beautifully decorated with leaves and a kingly crown. This ashtray measures in at 6.5 inches. The Greenman King Skull Ashtray is a beautiful piece that is hand painted. 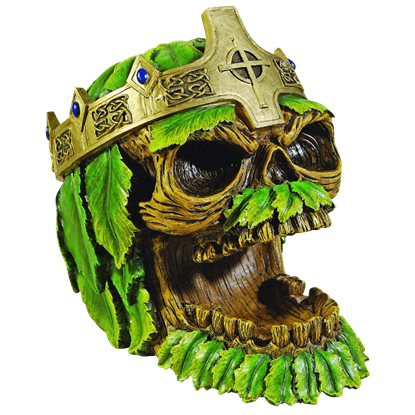 The Greenman King Skull Ashtray is made of cold cast resin and is decorated with leaves and a kingly crown. The top of the skull is a lid that comes off. If you have skulls lying around, it is understandable that you put them to use. A polished skull makes for a wonderful ashtray, making this Open Mouth Ceramic Skull Ashtray the perfect accent for your home. A pirate loves to do nothing more than hoard money, and with this Pirate Captain Skull Bank, you can let a pirate do just that. 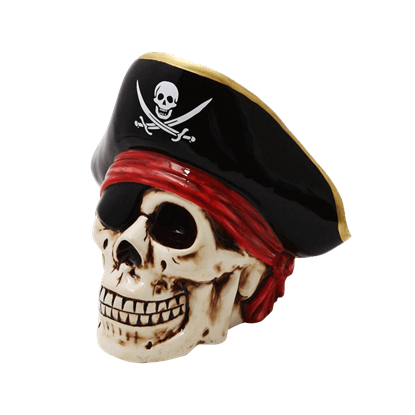 While this pirate hoards your money, you will always know where it is, safe and sound in this skull. Ravens are a curious sort, even when that curiosity might lead them into deadly situations. This raven lucked out, as this jawbone is fairly harmless. 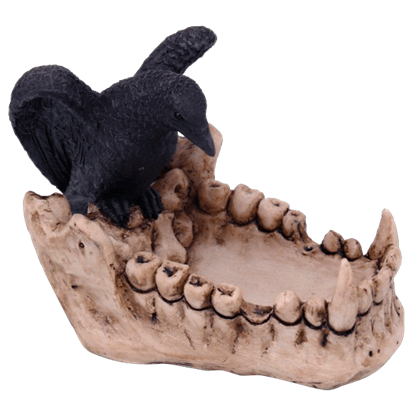 The Raven and Jawbone Ashtray can serve you well, though, as a fun accent. No matter what you are going to use it for, this ashtray will always be there to lend you a helping hand. The Skeleton Hand Ashtray will hold ashes, keys, coins, and other small items that could fit in the palm of a hand. Skulls have long been used as receptacles by different cultures, and some even used them as cups. With that idea in mind, it does not seem odd to keep this Skull Ashtray close by, so that you can use it to dispose of ashes and waste. 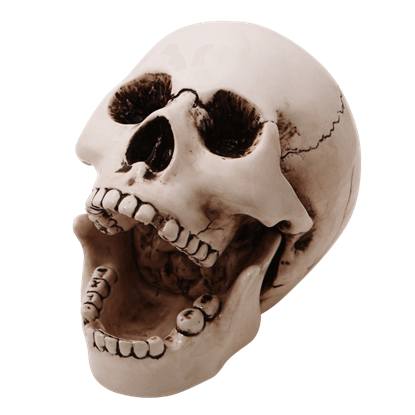 Put the remains of the dead to good use with this Skull Mouth Ashtray! 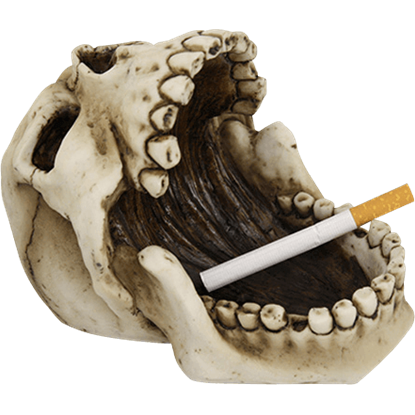 Created to resemble a real human skull, this unique tray will make a great place to hold your cigarettes or to throw your change or keys into at the end of the day. There is nothing wrong with having a stylized ashtray. If you are going to have and use one, then it might as well fit your style and decor. 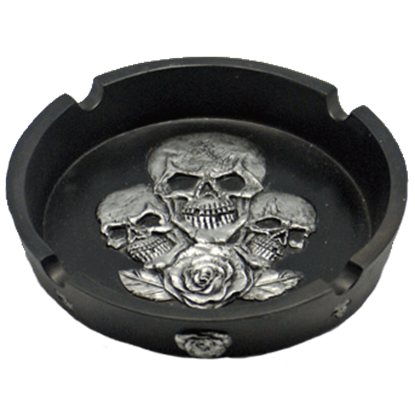 If skulls happen to be your favorite style, then the Triple Skull Ashtray is the one for you.